The perfect company for your moment of escape, made by the combination of tea extract, organic cane sugar and the juice of lemons from Italy. The first organic beverages from Sanpellegrino made with delicious tea extract and Italian fruit juice. Sanpellegrino's signature sparkle gets added to organic fruit tea. 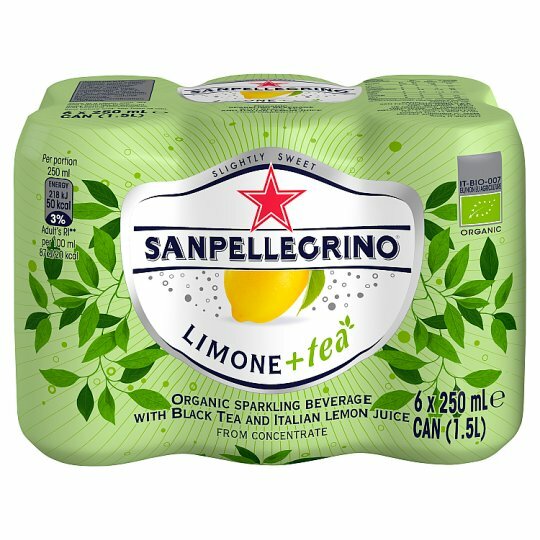 Limone+tea, Sanpellegrino's new sparkling fruit and tea beverage range made with 5% real Italian fruit juice. Carve out a relaxing moment in your busy schedule with Limone and Pesca+tea, containing 50kcals in every 25cl can. Store in a clean, cool, dry and odourless place, away from direct sunlight, and freezing temperatures., Best before end: see base of can.